Born in 1942. 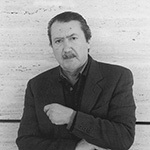 Carbajal studied at the Superior Technical College of Architecture, University of Seville, and worked as a professor at the same University from 1968 till 1989. At the same time he was designing and conducting various architectural projects. In 1990 the rehabilitation of the Falla theatre in Cádiz granted him the andalusian prize for cultural maintenance of historical and artistical heritage. During the nineties, and after leaving his position at the university, he started developing his own architectural projects. In addition he collaborated with Rafael Otero, José Daroca and Francisco Reina, architects he got to know both at professional and personal level during his years at the university. These were projects such as new town halls, theatres, hospitals, apartments and design of public spaces, initiated by official public administration. Furthermore the main part of these projects was gained through the participation in conceptual competition. In 1998 the design of the theological seminary granted him the annual architectural prize administrated by the Andalusian association of architects. The same work was honoured with a notification by the national Spanish architectural prize. In addition some of his work has been published in various architectural magazines, and he has also participated in diverse expositions and biennales like the Spanish architecture (I, III y V), the VI and IX edition of Mostra Internazionale de Architettura de Venecia, the south American Bienal for housing in Lima, the rehabilitation of the theatre of the foundation of C. Gulbenkian in Lisbon and the expo of Hannover 2000. In 2003, José Antonio and his sons, Nicolás and Rodrigo Carbajal, founded Estudio Carbajal, an architectural practice bassed in Seville. From 2005 he is also in charge of the refurbishment works of Real Maestranza of Seville Bullring. Born in 1971. PhD in Architecture from University of Seville. As a student he worked in the studio of José A. Carbajal until he finished his academic formation in 2000 and started working full time in Estudio Carbajal. During this time he has also conducted various projects in collaboration with R. Kruszewski, S. Solinas and G. Verd. In addition he works as a professor at the department of architectural design at the University of Seville. He has participated in different courses and workshops of international significance, as well as in some exhibitions and national or international publications. Born in 1974. PhD in Architecture from University of Seville. As a student he started to work in the office of José A. Carbajal. This work gradually became in a full time job. In addition he works as a professor at the department of architectural design at the University of Seville. His academically achievement were remarkable, and during the studies he also participated in different courses and workshops of international significance. Some of his projects has been published at various occasions in international and national architectural magazines and also at different exhibitions. In 2005 he graduated at the Higher Technical College of Architecture, University of Seville. In 2006 he also started designing his own projects at the same time as he continued his collaboration with Estudio Carbajal.